The team at ALTA loves motorcycles. The ones that make you tingle when you look at them, giggle when you ride them, and even scare you a little bit. They love going fast. And they love finding new ways and new places to go fast. Their goal was to create motorcycles that are easier to ride fast than anything else out there. They build electric bikes because they love instant throttle response and flat, endless torque. Because they want the next bike you purchase to be faster than your last one. The first sketches of the Redshift began in San Francisco in 2007. Two riding buddies, Derek Dorresteyn and Jeff Sand, with a few decades of fabrication, engineering and design expertise between the both of them, fell in love with the idea of the smooth, perfectly responsive torque curve. Naturally, they started kicking around the possibilities for building their own electric motorcycle— a motorcycle that could be faster and more rideable than their gas bikes. When ALTA was passing through Colorado and asked us if we wanted to come ride their electric motorcycle I couldn’t have been more excited. The idea of riding through the forest in complete silence and solitude sounded like a dream and luckily the experience exceeded all expectations. Getting some seat time on this motorcycle was such an enjoyable and innovative experience and as I hoped back on a gas bike I was already missing the ALTA. 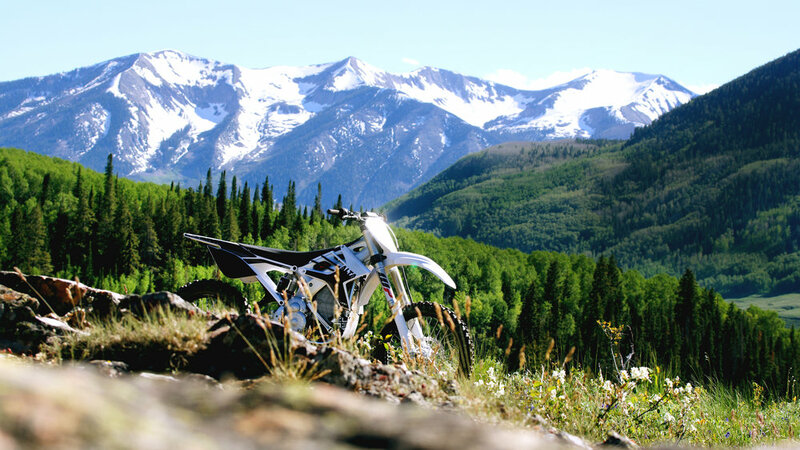 Riding the Redshift MX through the beautiful Rocky Mountains was a spiritual trip you would have to experience to understand. Reinventing the riding experience and challenging the traditional mindset of the motorcycle rider is a bold endeavor. But with the birth of ALTA’s Redshift MX, an entirely new realm of possibility has been unveiled for the evolution and growth of motorcycling. The intuitive design and advanced electric power source provides a quiet, more responsive and more predicable ride that could change the landscape of motorcycling in the future. Alta’s water-cooled 14,000 RPM motor is pound for pound one of the most powerful in motorsports. It is optimized to the narrow width of the Redshift’s bulkhead and is precisely located at the roll center of the bike. This placement allows for the lowest polar moment of inertia in motorcycling - drastically minimizing any gyroscopic impediment to handling. The Redshift's motor weighs 15lbs and puts out 40hp and 36 ft-lbs of torque. The unit pushes power through a 3.5:1 gear reduction to deliver a 122 ft-lbs of torque at the counter shaft from a dead stop and 0 RPM. WP is the largest motorcycle suspension producer in Europe, and we chose their product for the Redshift due to their technical prowess and ease of tuning. WP competes globally at the highest levels of competition and that expertise combined with their willingness to try new things has resulted in both the Redshift MX and SM using WP 4CS suspension built to our own spec as developed by the team here at Alta Motors. Brembo S.P.A. is the gold standard for high performance brake systems on motorcycles. Founded in 1961, the Italian company produces a range of products that can be found on motorcycles on the street and the trail. Both the Redshift MX and Redshift SM use cast and machined Brembo calipers in either a 2 or 4 piston set-up.